Greeting everyone! And welcome to yet another mini haul – two objects – which I got from the website Banggood. I have collaborated with them a few times, and they have been super nice to me and the products affordable and super nice! So click on to find out what I got this time! Have you ever seen one of those adverts on Facebook or TV of people removing blackheads with a device? Well, some of them may be on the more expensive side, but not this one! It’s only $4, easy to use and super practical. All you need are batteries and you’re good to go! It was also painless and it left my face smooth. 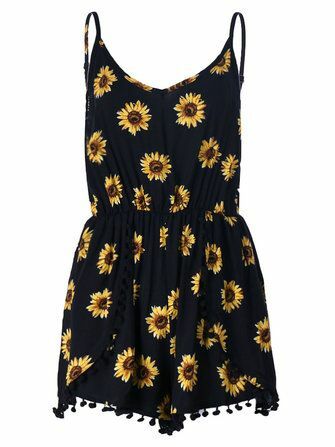 The other thing I got is this cute sunflower print playsuit. At first I was a bit skeptical about the size at first glance, but I changed my mind at once when I tried it on. It fit me perfectly from everywhere. The straps are adjustable from the back and can also be crossed at the back part. They were a bit flimsy but when I wore the outfit and properly placed the straps. I got it in a size XL and it costs just under $15. Looking for affordable yet cute outfits? Click here!